Designed to be used with anchoring from above you can be sure of the best in fall protection and you will have a totally safe area to work in. This system allows you to use a retracting line which can spooled in and out of the device as you are moving. If and when a fall occurs this unit will automatically engage the braking system. Its design allows for a controlled deceleration, thus preventing injury to the user either from hitting the ground or being yanked suddenly when the unit stops a fall. 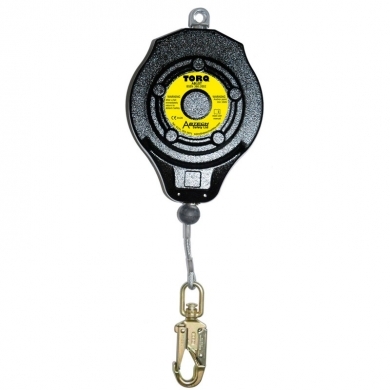 The AB15T 15 m fall arrest device conforms with BS EN 360. The manufacturers recommended a maximum user of weight is 150 kg. This is a solid and reliable safety device you can rely on when working at height or in confined spaces.